An Apple patent application published on Thursday describes a portable device with a flexible OLED screen capable of retracting into two hollow casings, suggesting the company is looking into alternative hardware formats for flagship products like iPhone and iPad. 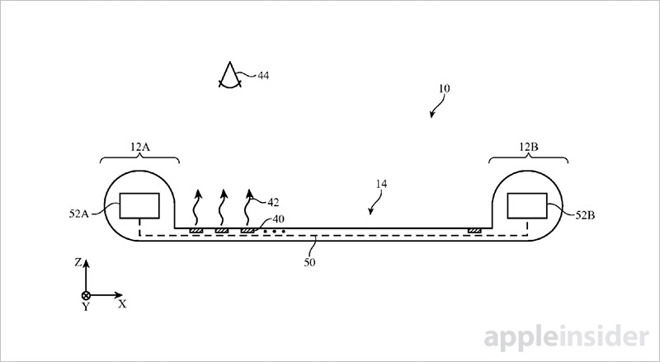 Apple's patent for "Electronic devices with retractable displays," as published by the U.S. Patent and Trademark Office, details what can best be described as a futuristic digital scroll. The design allows for two elongated, barrel-shaped housings into which are crammed the retractable screen, processing unit, cameras and other components. Like current Apple devices, each housing can be crafted out of a single piece of aluminum or other suitable material, including glass, ceramic, fiber composite or plastic. Electrical components like speakers and microphones might be mounted in alignment with openings or microperforations disposed in either the left or right housing. Cameras are also mounted within one or both of the elongated chassis, positioned behind optically transparent windows. Interestingly, the design allows for left and right cameras to be spaced relatively far apart from one another, an arrangement ideal for capturing stereoscopic images. 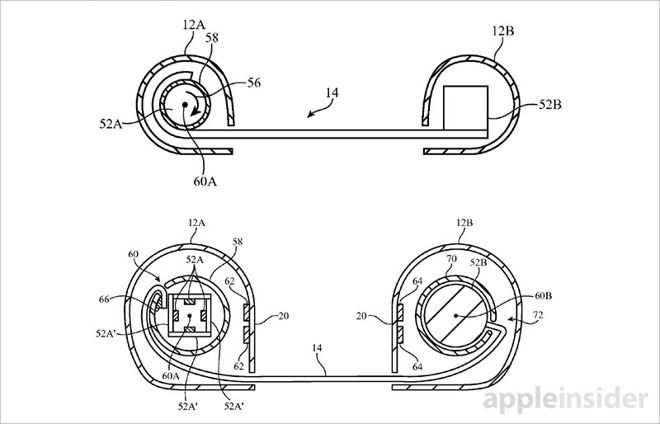 As hinted at in the application's title, Apple's proposed device is specifically designed to accommodate a retractable display. The elongated left/right housings are left intentionally hollow and contain rollers to receive the flexible screen when it is retracted. Said rollers might also be hollow so as to allow for the insertion of operating hardware like circuit boards, system memory, storage, vibration motors and other components. Alternate embodiments forego a roller mechanism in place of static internal structures around which the display naturally coils. When deployed, the OLED screen unfurls from the roller barrels, or pillar structures, out of slits in each housing and locks into place with the help of support slats. In some embodiments, the supports include a series of bistable metal members that become rigid when forced into a flat state. Snapped back into a flexible state, these same support members are able to bend with the stowed display. Upon releasing a latch mechanism, the screen coils back into its housing, aided by an internal spring located in one or both housing rollers. A static or rotating brush clears the screen of debris before it slides back into the sheath. Finally, magnets hold the support slats, housing and other movable components together when the device is closed. Considering Apple's contemporary design themes and the current state of the art, a device similar to the one described in today's patent filing is unlikely to come out of Cupertino anytime soon. Beyond design considerations, hardware supply is a significant hurdle to overcome. While extremely flexible OLED panels do exist, as do manufacturing techniques for the same, display makers lack the production capabilities to sustain a product like iPhone. As it is, OLED screens bound for Apple's rumored next-generation iPhone are said to be in extremely tight supply. Apple's patent application for a device with retractable display was first filed for in August 2015 and credits Zhen Zhang and Paul S. Drzaic as its inventors.